The more common a password is, the easier it is to guess. When a password can be guessed easily, all of the accounts protected by the password are at risk. Unfortunately, many of the people who use common passwords don’t realize that the word they have chosen isn’t protecting their accounts like it should be. 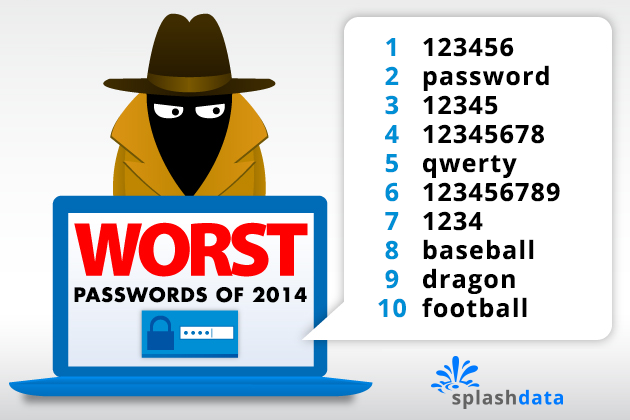 To help you avoid these mistakes, below are some of the most frequently-used passwords from 2013, as reported by CBS. 123456 – Up one spot from 2012, these six digits compose the most hackable password of all. password – “Password” used to own the number one spot, but it has since fallen. However, “password” still leaves an account extremely vulnerable to hackers. 12345678 – Even though it’s eight digits in length, this password is still extremely easy to guess. qwerty – Previously in the number five spot, “qwerty” has grown in popularity over the last year. abc123 – Some people may think that this password is safe because it combines both letters and numbers. However, it is far too popular to be safe. Even strong passwords sometimes fail. When you use them to protect something important or confidential, like a timesheet, the consequences of a breach can be significant. Fortunately, you can avoid the hazards of easy passwords altogether by using Fingercheck. With Fingercheck, employees can clock in using a fingerprint scan or facial recognition technology, and hacking is nearly impossible!